My latest commission was for a black tie wedding guest dress. On our first meeting, we threw around some ideas and came up with a long and lean silhouette and an emphasis on the waist. 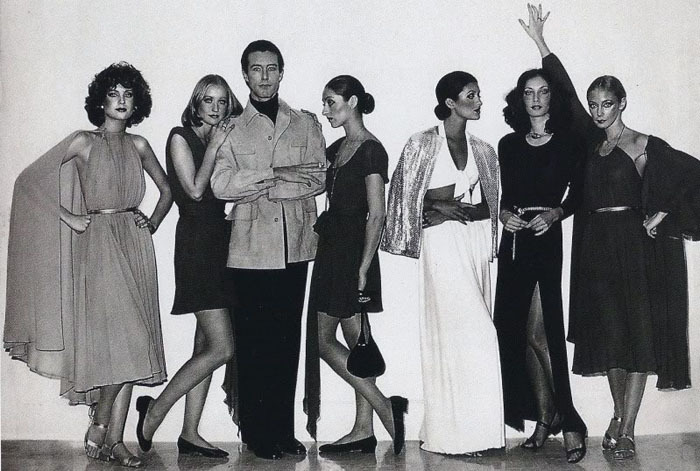 When I think of long, lean and glamorous, Halston’s jersey clad girls come to mind. Studio 54 era languid and stylish women (Cher, Diana Ross, Jerry Hall and Bianca Jagger to name a few) dancing with easy and confidence. The obvious choice would be a black dress but felt a rich jewel colour would have more of an impact and luckily found a teal four-way-stretch jersey. As always, I started with a mock up version to check for fit and styling details. To accentuate the waist, a twist detail pulls in at smallest part of the body. As it’s such a large feature, I left the rest of the design simple in order to let the design breathe. After the fitting, a few changes were made. Instead of cutting the neckline to cover the bra, it was more flattering to let it form within the draped folds. Shoulder pads were added to balance out the hip line which made the waist look smaller. Long sleeves more modern and I think it’s a good rule of thumb to cover up in one area when another is exposed. Another tip for jersey garments is the ‘flash test’. Get someone to take a flash photo of you in the dress to check how transparent it is. I doubled layered the fabric as you could see the legs through the skirt. The main thing to check is if you can dance in it because any good wedding has you dancing til the early hours. « Previous PostBridal: Helpful Tips For A Future Bride Next Post »Fashion Exhibition: Hello. His Name Is Paul Smith.